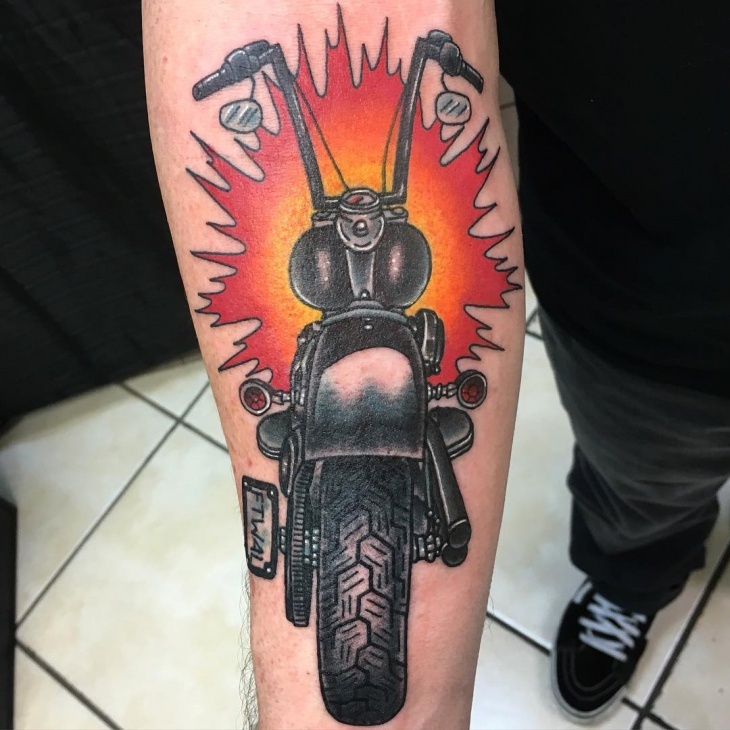 Motorcycle tattoo designs are unconventional and highly loved by sports enthusiasts, especially those with the love for speed and all things sporty. 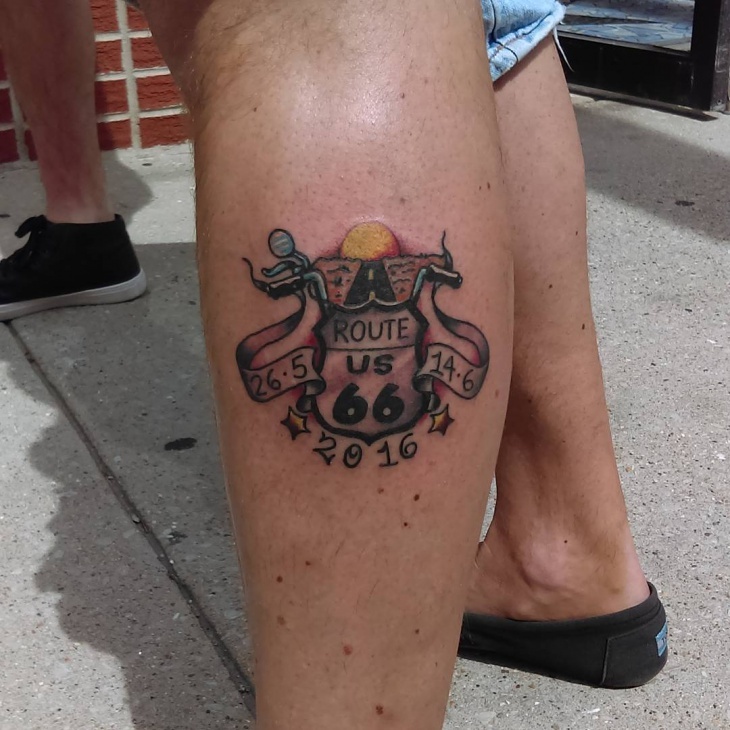 Motorcycle tattoos are usually worn by bikers who love to express their admiration for the design. These tattoos are a symbol of freedom and liberty. Also popularly known as Steampunk Tattoo, these designs with an artistic touch have taken the form of tattoo art in the best way possible. 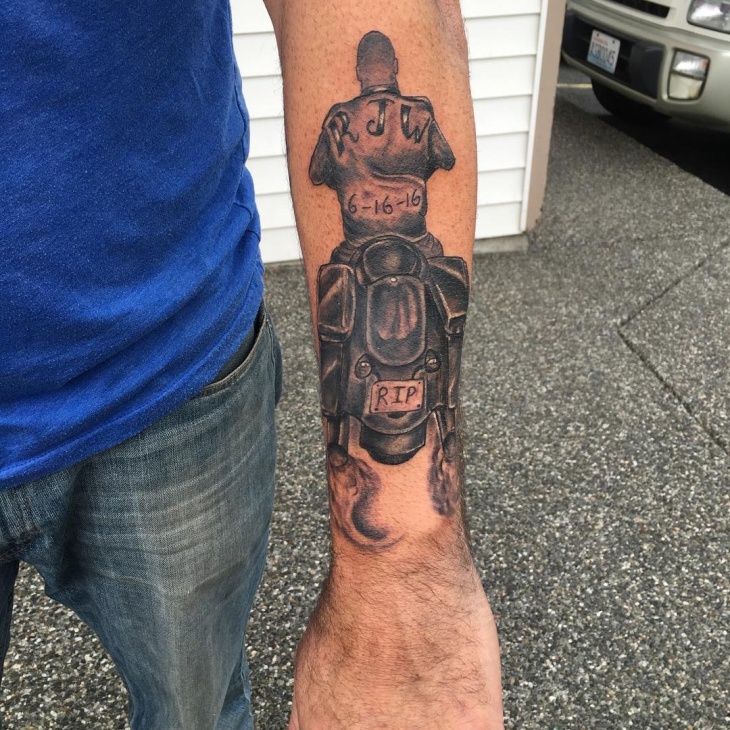 This is a traditional motorcycle tattoo sported by a young man on his hand. It is colorful and fierce, which represents a bold and striking style. For those who love sports and speed, what better theme to get your body inked than this? This tribal print tattoo with a motorcycle is one crazy tattoo. It is bold and amazing. 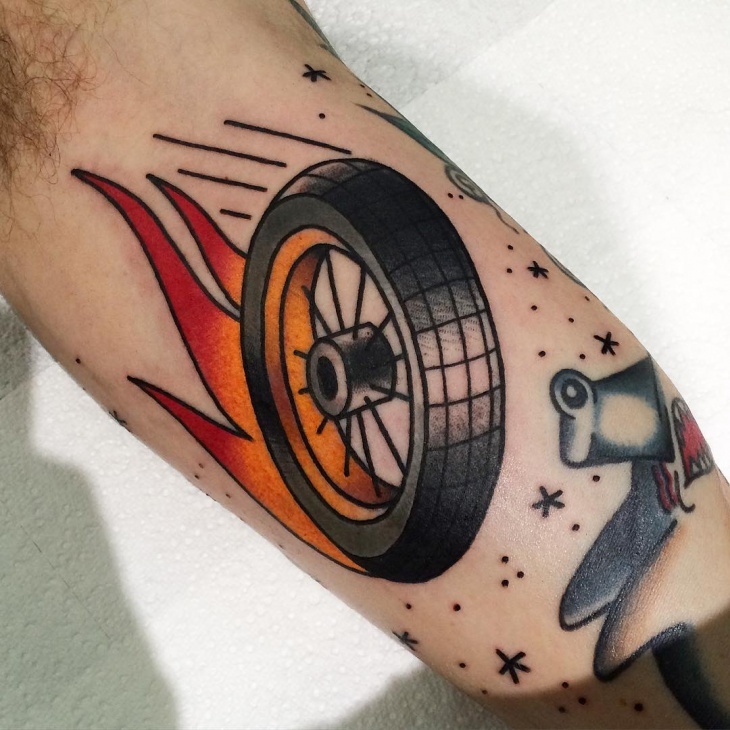 This biker tattoo is perfect for men or young boys who are crazy about bikes and speed. It does not have too many graphics but is plain and classy. 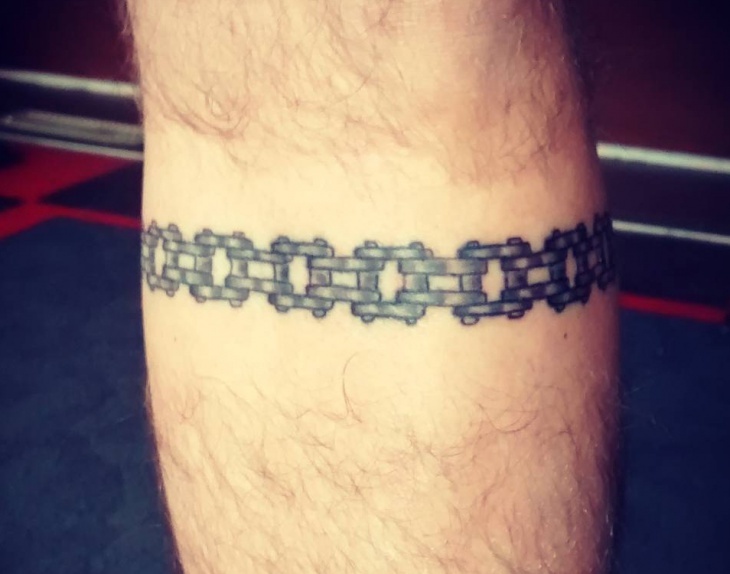 This chain tattoo is elegant, classy and bold at the same time. Sported in the wrists in black color, it is one tattoo that will surely stand out. 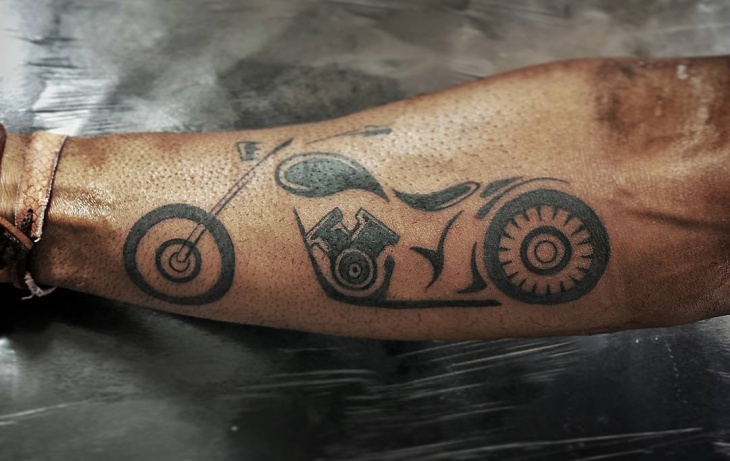 If you are a die-hard bike lover and up for turning heads around with your tattoo design, we suggest you to sport this tattoo design. 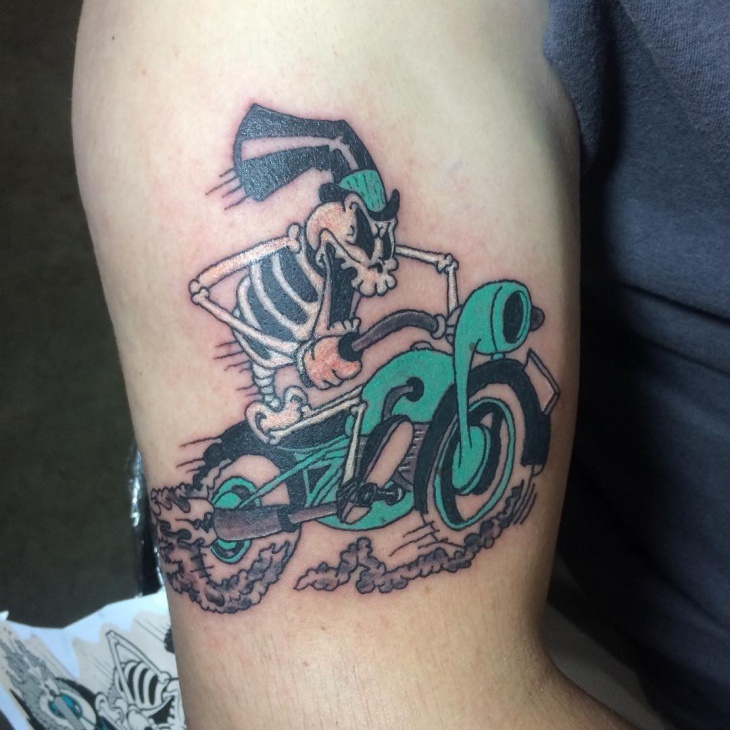 This is a vintage style motorcycle tattoo with a Halloween theme. 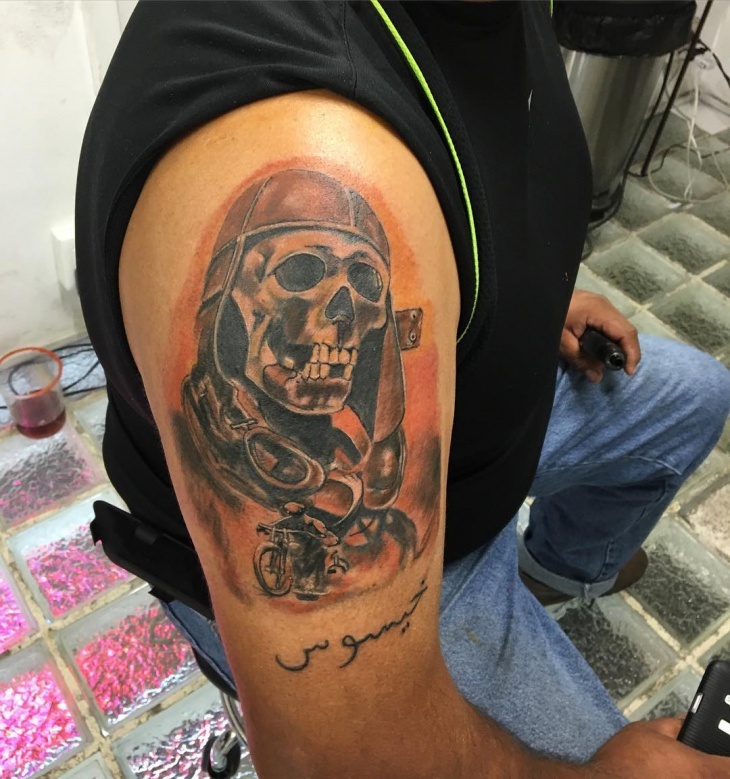 You can see that the rider of the bike in the tattoo is a skull face which is a bold take on the motorcycle tattoo. 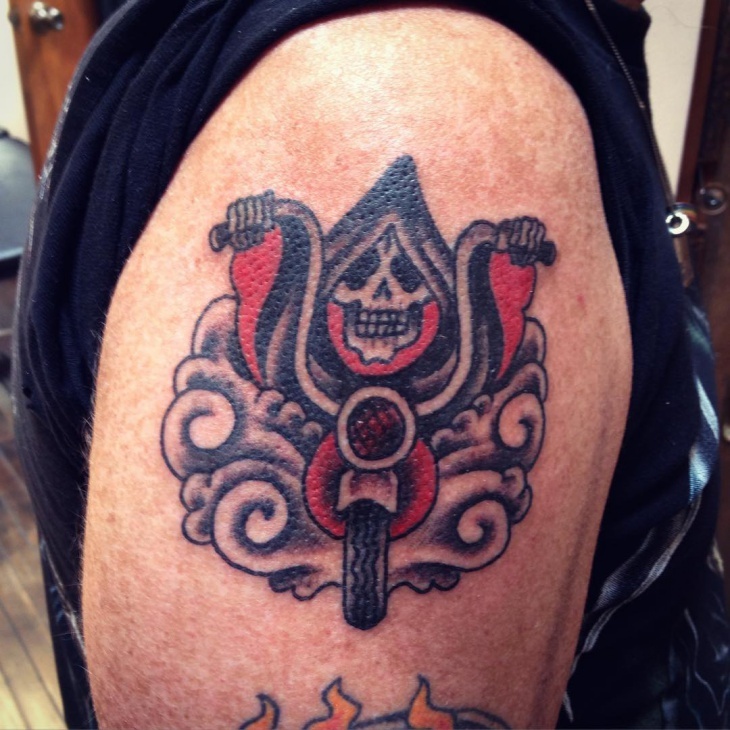 For all you bike lovers, this design is sure to add intensity to your tattoo. 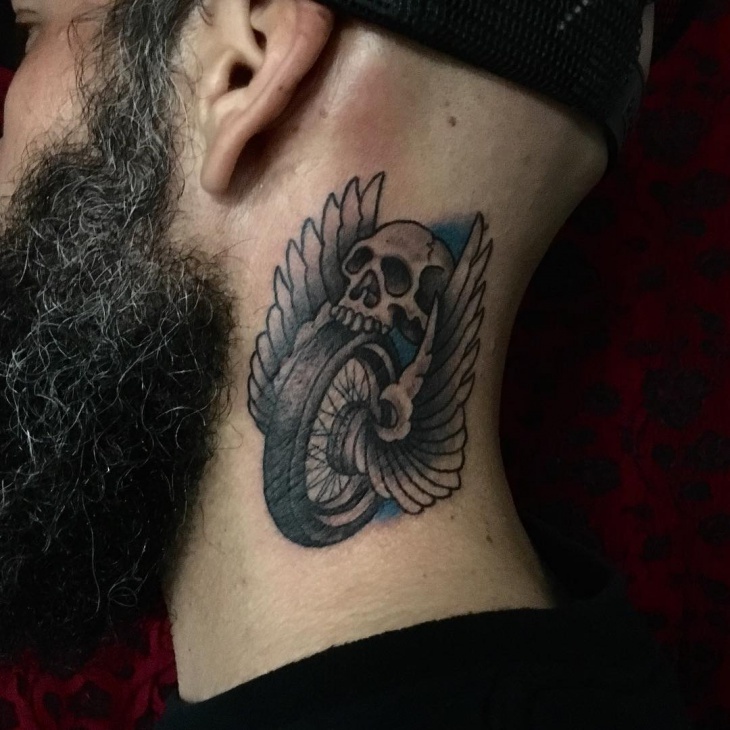 A motorcycle helmet tattoo with yet another Halloween theme, also considered as chopper tattoo and Harley tattoo. A large skull is seen wearing a helmet alongside a motorcycle rider. Tattoo artists are coming up with several odd themes. 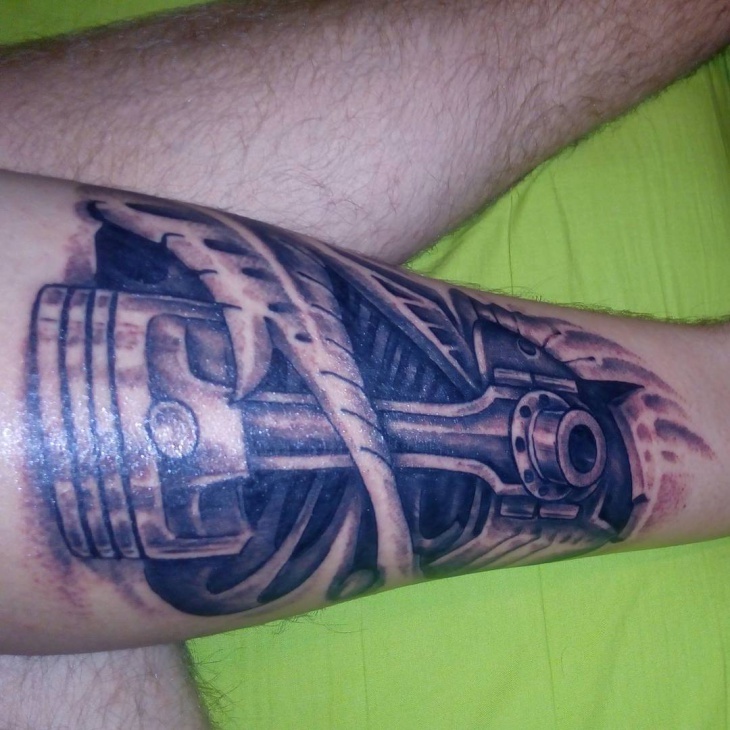 This is a motorcycle piston tattoo which shows a large image of the machine used in the bikes. Those who live by the love for speed and machines, they choose to get their hands inked with tattoo designs having themes like this. 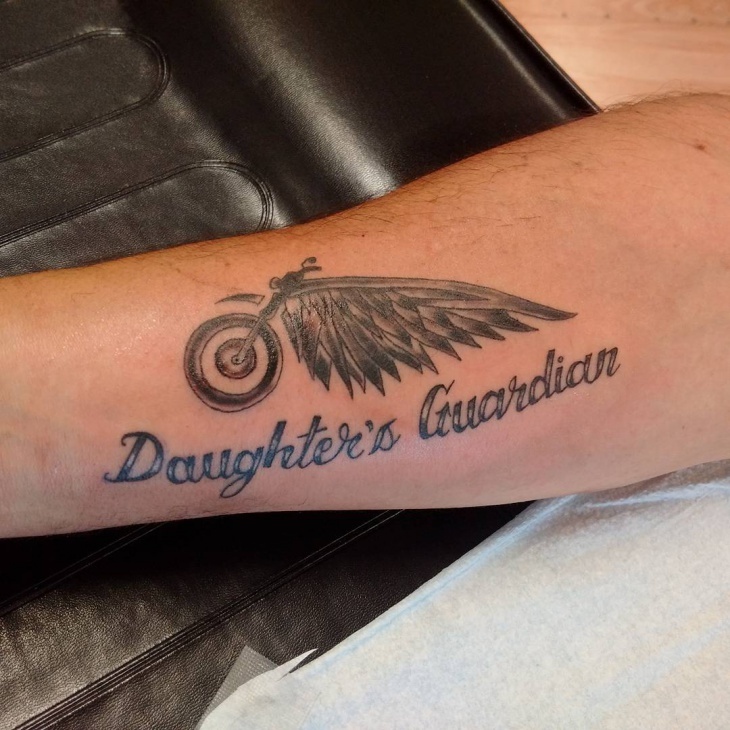 This tattoo design contains motorcycle text written as “Daughter’s Guardian” with wings drawn in the sides of the motorcycle. It is an amazing tattoo designed by a lady artist that represents the level of freedom one acquires by riding the motorcycle. This tattoo with motorcycle parts inked on the hand is a colorful tattoo. The wheels of the vehicle are drawn in the hand along with the momentum of speed it creates which is shown in the form of fire. 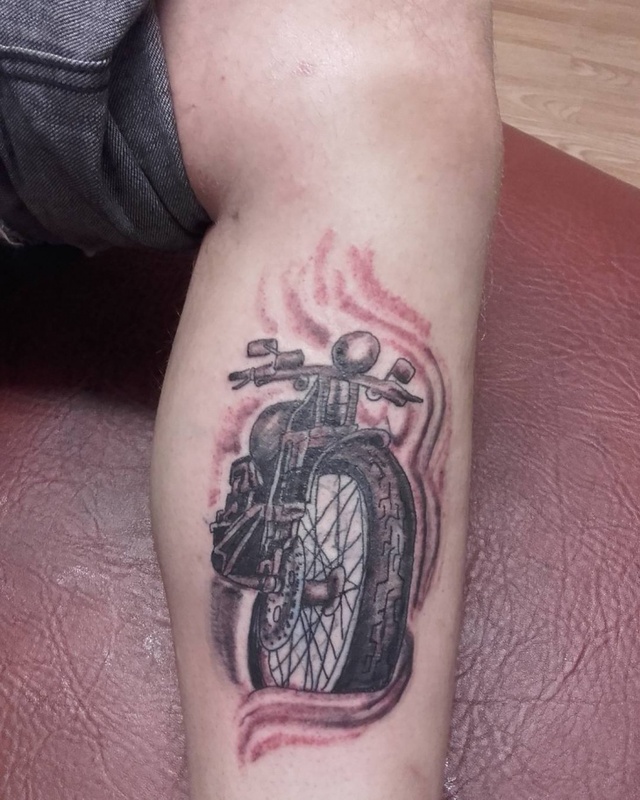 A very sporty tattoo with a motorbike inked in one of the arms by a young boy, this tattoo is all about body art and love for motorcycle sport. Getting your body inked with your fave sport is one of the best ways of expressing your passion and love for the same. 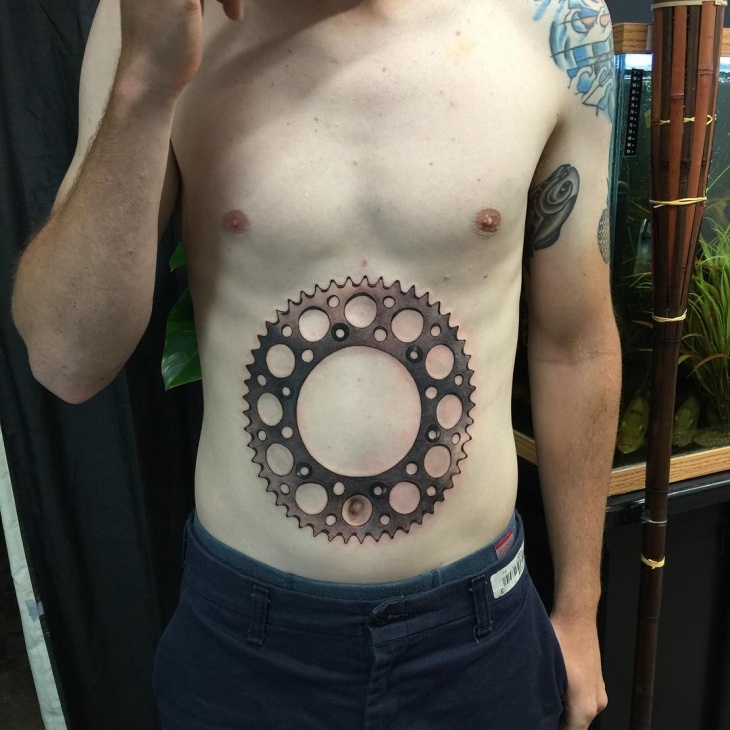 This is a motorcycle’s sprocket tattoo design. 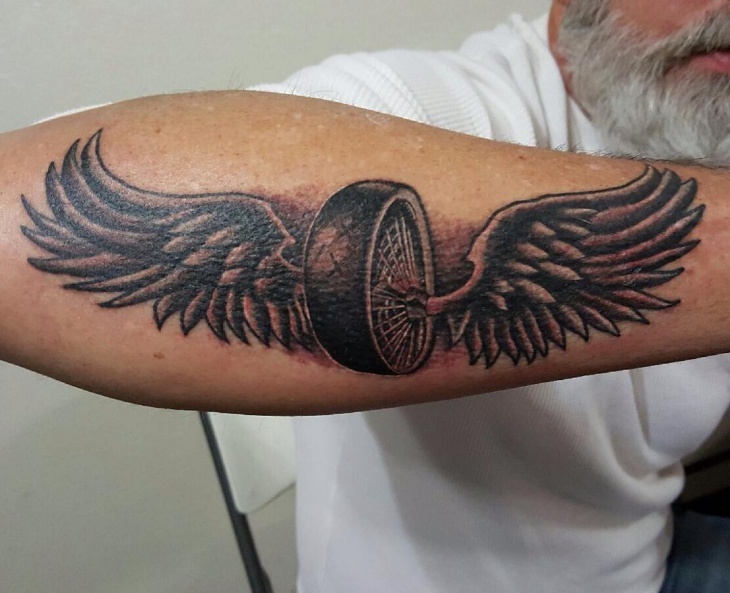 This tattoo design is perfect for motor freaks with the love for riding bikes and love the sound of vehicle moving and riding with a daunting speed. 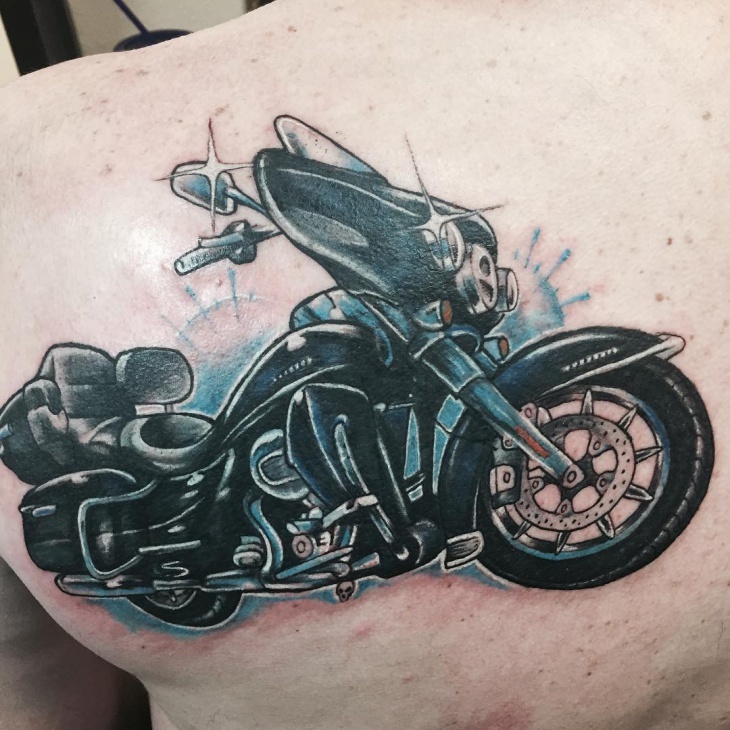 Biker tattoos are loved by all sports enthusiasts who love riding bikes and motorcycles on high speed. It represents the love for freedom and liberation. 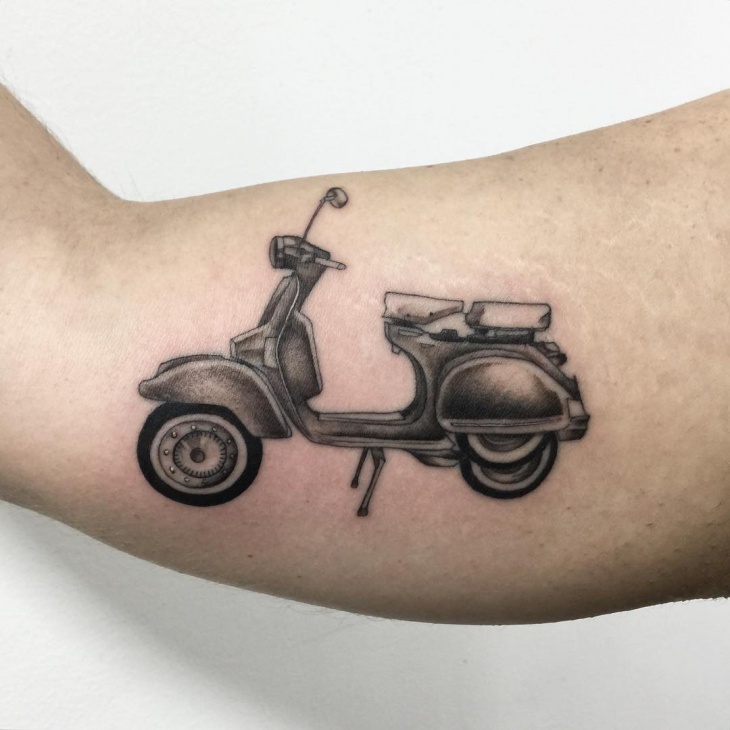 Riding a bike or motorcycle is without doubt an exhilarating feeling, thus sporting the tattoo reflects a sense of independence and the love for the sport.